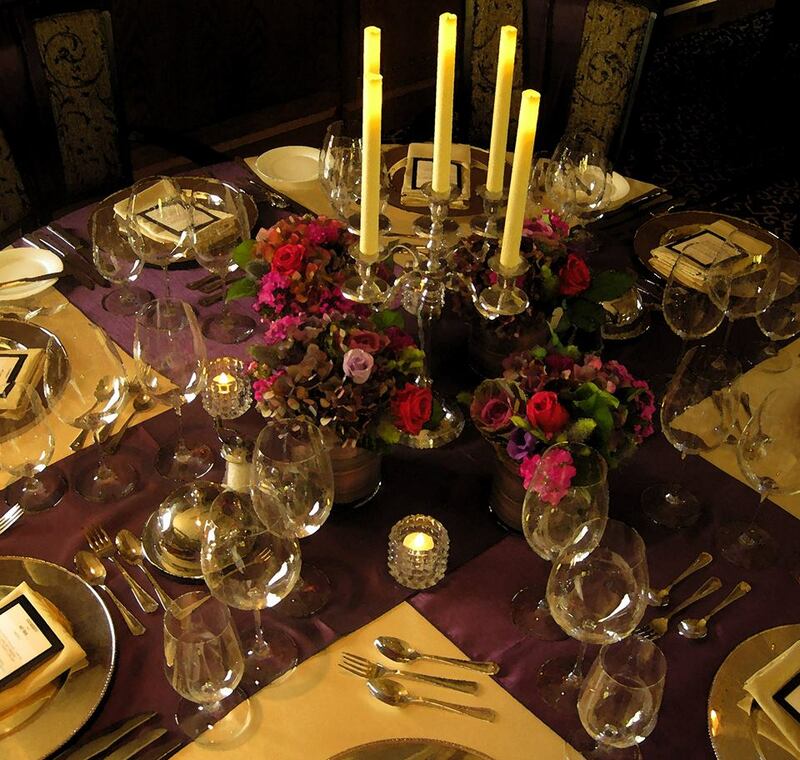 We did a lovely small wedding this weekend that was just filled with lovely candlelight…candelabras everywhere…the palette was champagne & eggplant with a few cranberry accents…perfect for the beautiful autumn day…and perfect as a backdrop for all the candles. 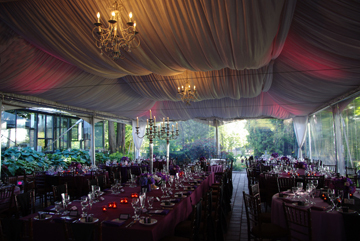 We had a picture perfect purple wedding on the weekend in Vancouver. 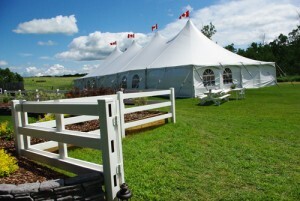 The weather was glorious, the bride was gorgeous and the bridal party was gigantic! The processional of 27 (!!) was a fabulous cast of characters that included 2 tuxedo-clad pugs, a pregnant bridesmaid more than a week past her due date, 2 fathers-of-the-bride and a handful of NHL players. 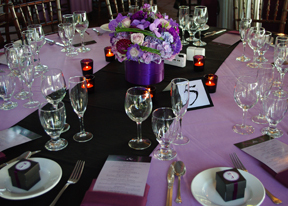 The palette of purples ranged from lilac to aubergine and was used in everything from their custom invitations, the flowers, the 3 shades of linens, the uplighting in the tent, the cake, the cupcakes, the 12,000 rose petals that lined their aisle, the custom M&Ms in their purple monogrammed favor boxes, the custom labels on the wine bottles, the custom menus, table numbers and seating charts, to the purple haze martinis that greeted the guests as the ceremony finished…it was truly spectacular. 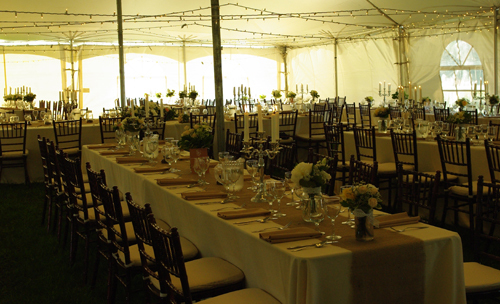 Special occasions call for gifts, and weddings are no exception to this rule. From Do I really need to send a wedding gift? to What if I already brought a gift to a shower?, here are some guidelines for wedding gifting. 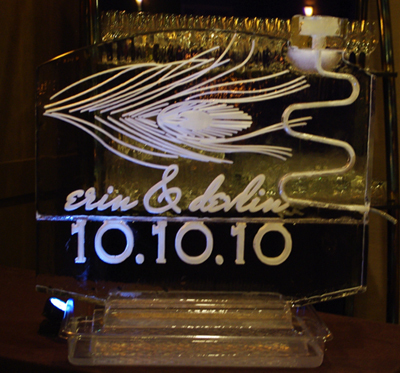 Close friends and family usually do give the couple an engagement gift, and in many parts of the country it is customary to bring a gift to an engagement party. 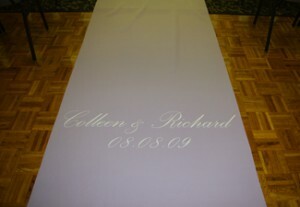 An engagement gift is more of a gesture of affection and needn’t be expensive or elaborate. 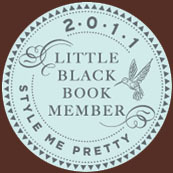 Something simple, such as a picture frame, cookbook, or a nice bottle of wine to start a collection, is the way to go. 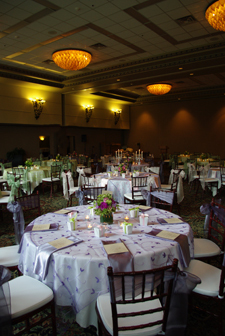 As per tradition, it is expected that wedding guests give gifts to the bride and groom. 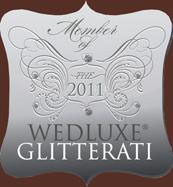 When choosing a gift keep your relationship and affection for the bride and groom as well as your budget in mind. 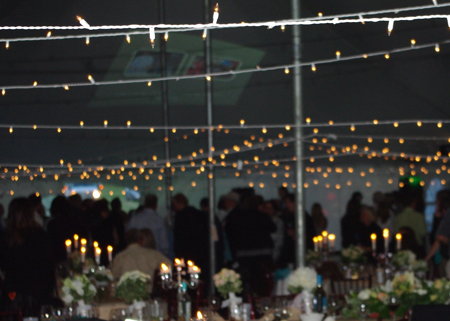 Whether you attend or not, send a gift in appreciation of this most special invitation and to honor the marrying couple. 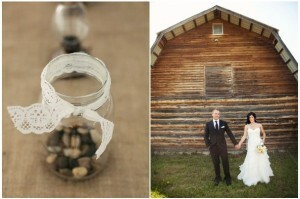 It’s traditional for the bride and groom to give gifts to the members of their bridal parties. Whether this means earrings for the bridesmaids, cufflinks for the groomsmen, or monogrammed tumblers for all, don’t over think it. Keep it simple but significant to show the bridal party your appreciation and allow them to remember the occasion in the future. 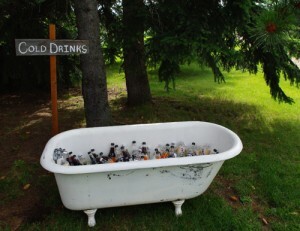 For guests, the key to selecting shower gifts is finding something the couple can use while staying within your budget. If attending more than one shower, it’s okay to bring a gift to the first one and then bring a card or smaller token gift to the others. 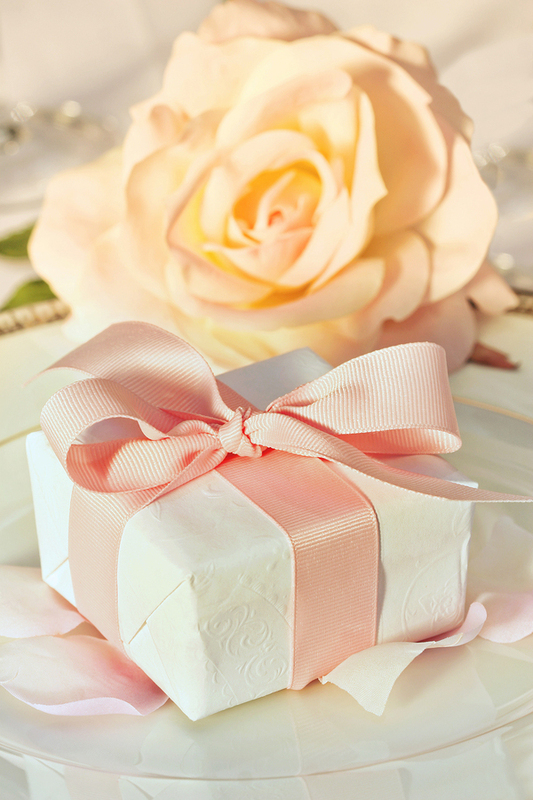 Regardless of your gift choice for a shower, don’t forget to plan for a wedding gift, too. Wedding favors are entirely optional but have become a popular way for the bride and groom to show their appreciation and thank their guests for being with them on their special day. These are usually smaller commemorative items-mini boxed chocolates, little jars or sachets of candy, match boxes printed with the date, personalized packets of wildflower seeds-presented to guests atop a place setting or arranged on a table for taking home. All in all, it is important to keep in mind that it is not the price tag that matters, but rather the thought that really counts. 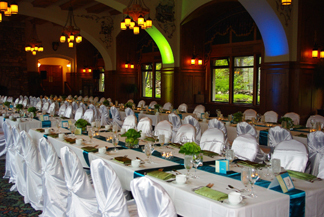 This wedding had a very juicy colour palette of turquoise, teal and apple green. 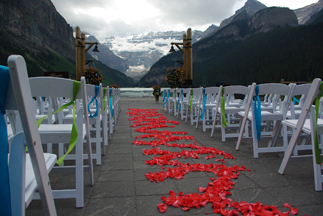 For the ceremony it was punctuated with a pattern of coral rose petals down the aisle which perfectly matched the bridesmaids dresses. With the magnificent view of the lake and the tempestuous skies, simple was all that was required for a truly memorable ceremony site. The very moment the bride signed the marriage license there was a great clap of thunder and it started to rain. The groom was thrilled with the timing…he told me now he’s got a great story for the rest of his life! 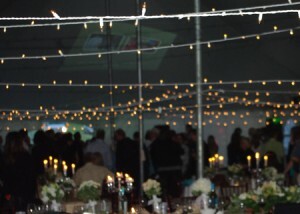 Cocktails managed to be both cozy & elegant – and the two signature cocktails were a huge hit. 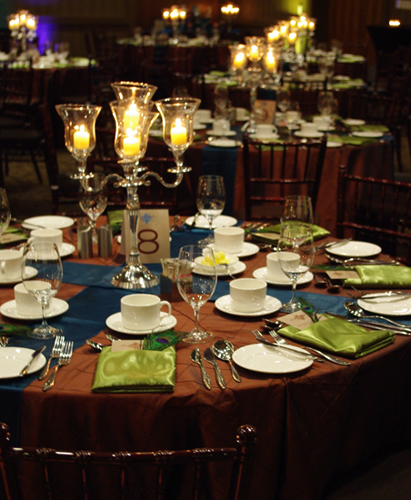 Some well-placed uplighting can really make a huge difference. 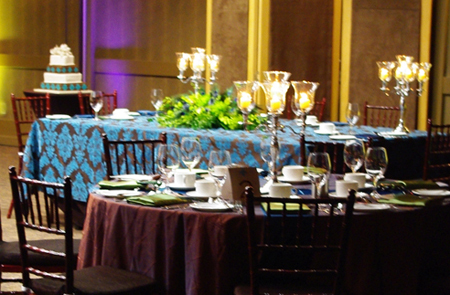 The alternating green + blue on the columns surrounding the guest tables both accentuated the colour palette and delineated the room. I made sure the bride and groom had a great view of the lake…but with such amazing vistas from every angle, it didn’t really matter where you were seated in this beautiful space. 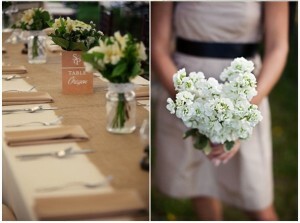 The details were kept quite clean and chic. 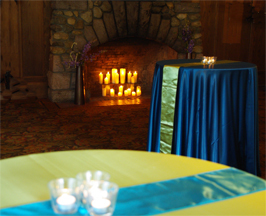 Centerpieces of granny smith apples and green hydrangeas and orchids, teal runners and green napkins, our ubiquitous custom wedding day printing and a ton of candlelight. 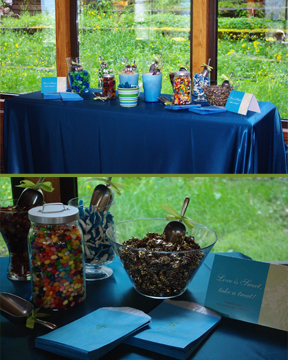 The custom glassine bags were so cute…the candy buffet was a huge hit…guests started raiding the candy buffet before dinner was even finished…sour gummy worm anyone? 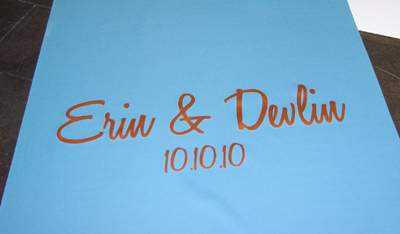 Here is a 10.10.10 wedding that was 16 months in the planning and 10 years in the making…Erin + Devlin are an awesome couple that decided to get married on their tenth anniversary of dating. At various stages they thought they’d get married in Jamaica or India, but in the end decided to get married in Calgary so all their friends and family could attend. 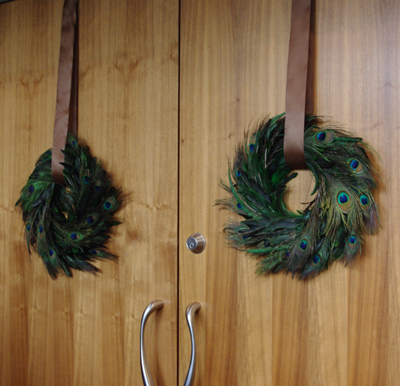 The peacock feather was our inspiration….which gave us a sumptuous colour palette…coppers, teals, browns and greens. 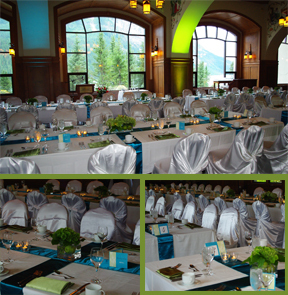 The bride walked down the blue aisle runner (with copper monogram) in her fabulous teal shoes. The bridesmaid wore navy and the maid of honour wore chocolate brown. The groom, best man, and father of the groom wore very stylish brown tuxedos. Deep Blue Sea martini anyone? 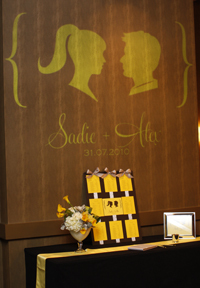 The seating chart, menus, table numbers, candy buffet sign, photobooth pix, martini luge, and dance floor gobo all bore their custom wedding day logo with touches of damask & a peacock feather….pretty! 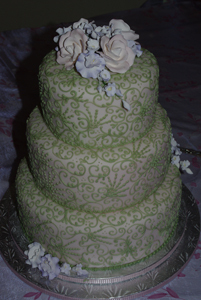 The head table was adorned with teal & brown damask which was reiterated on the cake. 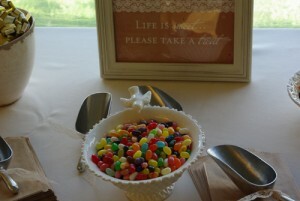 This wedding was a wonderful combination of sleek & modern with a twist of retro. 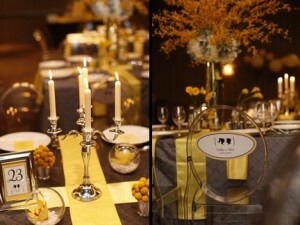 The palette was yellow, saffron, grey and silver and everything looked positively scrumptious! The reception began with poolside cocktails. 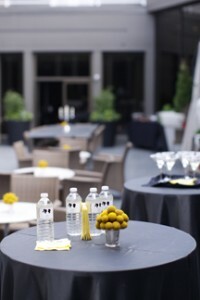 The guests were treated to an abundant supply of lemon drop martinis and customized water bottles…. I was so enamored with this candy buffet I could barely tear myself away. 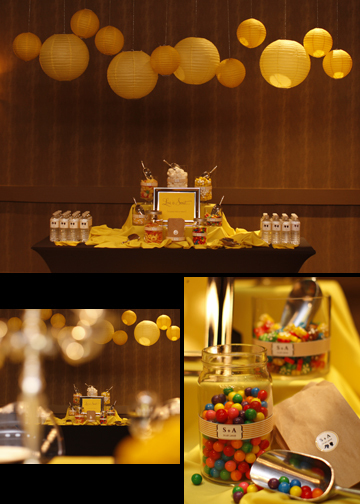 We’ve done lots of candy buffets before but with this one we got to make all the details just right. I was so excited with this design. The multiple shades of yellow on the beautiful pewter pintuck linens was so sharp and fashion forward – but still very warm & inviting. The vinyl cling on the back of the ghost chairs was a huge hit…we always like to make the bride & groom’s chairs a little bit special. These tablescapes were definitely my favorites in a long while. 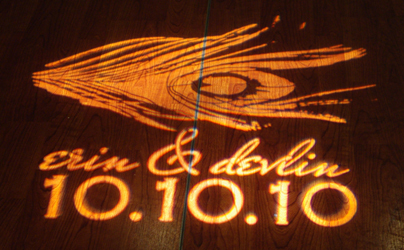 Usually we do a gobo on the dance floor, but this time we had it shining on the wall over the guest book table and seating chart. 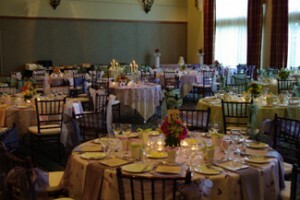 All the floral arrangements were fun & fabulous. Love is Sweet…Have a Treat!! wishing everyone much health + happiness + all good things for 2014! 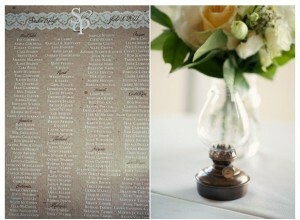 When a beautiful wedding invitation arrives in our mailbox, imagine if we could RSVP in the most honest way. 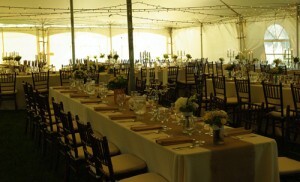 Attending weddings can be expensive. So here are some tips to help you emerge from the tulle-draped, flower-petal littered and champagne filled celebrations with more of your money in the bank. Also, more couples are opting for destination events which raises costs for traveling guests; 24% of all American weddings in 2012 were abroad, up 20% since 2008, says TheKnot. Statistics Canada’s 2008 data shows that men get married at an average age of 31.1 and women get hitched at 29.1. So for recent graduates with student loans and for people with new careers trying to build wealth, a flurry of weddings invitations couldn’t come at a worse time. So how much are you supposed to give? Well, you don’t have to give anything if you don’t want to. These emotional highs can sometimes lead to brash decisions — such as the decision to unconditionally give your newlywed children extraordinary wedding gifts. She has planned several weddings in the last few years where the couple either didn’t want gifts or asked for charitable donations. 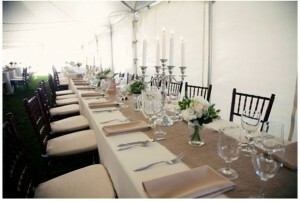 Buying a silver spoon is the least of our problems if we get the call to join the ranks of the wedding party. (It’s like having the honour of being knighted, except the sword cuts your purse strings.) According to the wedding site TheKnot.com, the average bridesmaid could face a bill for $1,385 when adding all potential costs. Julianne Taskey, a 31-year-old Toronto resident who works in fundraising has been in six wedding parties; she spends about $1,000 to fulfill her bridal party duties. “I’m a spender. It’s someone’s special day so how do you put a price tag on it. How do you say, ‘No?’” she says. Take just one of her events. The cost included more than $400 for a bridesmaid dress, $150 for hair and make-up, $80 for shoes, $50 for a pedicure and manicure. 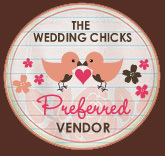 Add to that $150-$300 for a wedding gift, $50 to $100 for shower gifts and $500 for the bachelorette party. 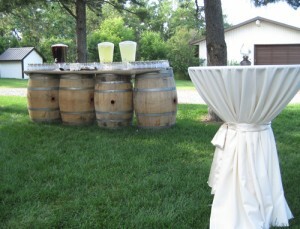 “The rooms, the cabs, the drinks, strippers, the bridesmaids tank tops. I probably have four [tank tops],” she says. Debauchery isn’t cheap. At bachelor parties, Armando Guedez’s friends call him “the banker.” That’s because the 31-year-old Toronto resident doesn’t drink much. “They’ll give me the money and my job is to make sure they don’t make stupid decisions with their money,” he says. Michael O’Farrell, a 31-year-old entrepreneur who lives in Gatineau, Que., flew to Las Vegas for his cousin’s bachelor party. I’ve said “no,” and not sent a gift (which according to my mom, is the rudest thing in the world). I’ve said “no” to being in someone’s wedding party. I also don’t go to what Winnipeggers call “socials” or Jack and Jill parties where guests pay a cover and buy raffle tickets to help raise money for someone else’s wedding. 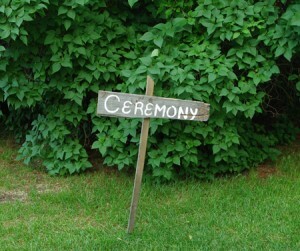 “I’ve been invited to a Jack and Jill where I wasn’t invited to the wedding. 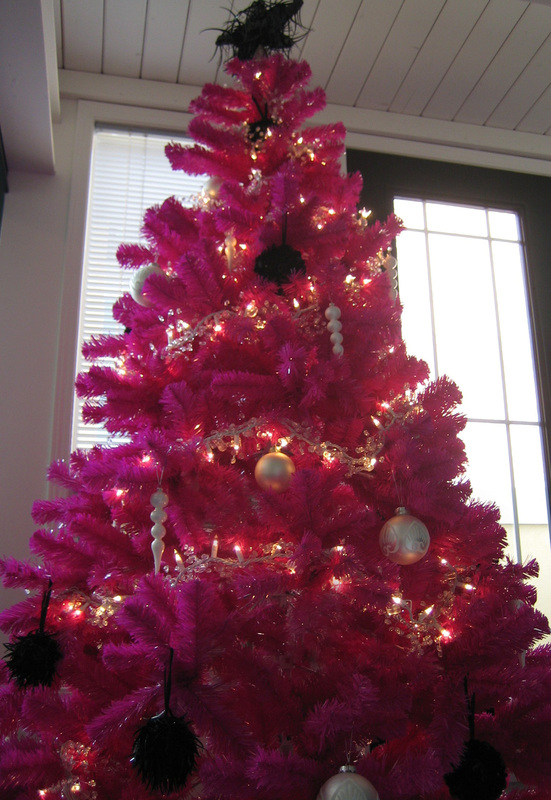 It’s so tacky,” says Kirsten Ellison, a 28-year-old student at the University of Calgary. She has three weddings to attend this summer in Ontario and one bachelorette in Las Vegas. She’s been saving and spreading out the costs for the flights, for the “spa-rty” (spa party) ahead of one wedding and the hotels.